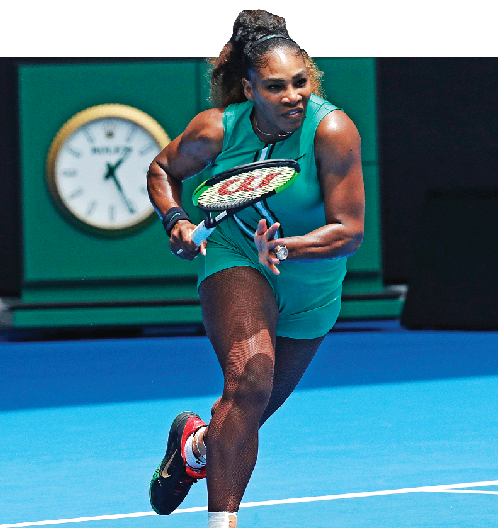 Serena Williams unveiled her latest fashion statement at the Australian Open on Tuesday, and helpfully ended any confusion about what to call the striking garment. “It’s a Serena-tard,” Williams told reporters when quizzed about her latest look. Made of jade-green lycra with a black-and-white waistband, the skin-tight outfit looks like a pair of disco-era hotpants attached to a builder's singlet. In the meantime, Williams says she made sure the first doll her daughter Alexis Olympia received was black, and her second one will be white as she teaches a message of “love for each other”. “Qai Qai is a doll I got for her. I wanted her to have a black doll,” she said after easing into the tournament second round Tuesday.